October 31st, 2016 update. Five years on and the panels have generated 9,800kWh of free electricity. The original estimates of what we would generate have proved to be uncannily accurate. One was 1970.072 kW p.a., so 9850 for five years. That was based on the government’s Standard Assessment Procedure for energy rating buildings. The second estimate was based on PVSol Expert 4.5; it gave us an annual total kilowatt hours estimate of 1898 kW – 9490 over five years. Not bad, either one. Just after 4 o’clock yesterday, a dank drizzly day in October 2011, the engineer said to me: “ You are now generating your own electricity.” It was a thunderbolt moment. We could have celebrated with a cup of tea, but they had a long drive home, he and his colleague from EOS Energy, young men doing the real new jobs in the UK’s tentative march to a greener future. Within half an hour, whatever little light was left in the drab afternoon had started the meter on its way. What had been a long line of noughts advanced to a long line of noughts with a “.8” at the end of it. .8 was a mere token, probably enough to power the light in our fridge for a couple of seconds. But it had the significance of a full-on searchlight. For the first time in my life I was living in a house where the electricity, even if ever such a tiny part of it, wasn’t coming from the National Grid. On a practical level we are pleased that our whole solar energy exercise went so smoothly. 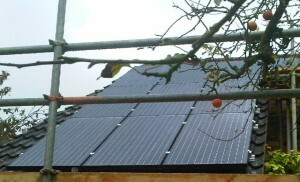 13 solar panels were fitted to our roof over two days. First came the scaffolders, to put up the poles and platforms and ladders in about half a day . The two engineers had a 80 mile drive to reach us, which suggests that although there is a big rush to fit panels just now, there is still a shortage of skilled men (and women?) to do the work. Cables were run up the wall from electricity meter to attic, the inverter was fitted, the panels were laid, adjustments made and the men were gone within eight hours. Today is the first day in the rest of this house’s life. We have a silent and inoffensive photo voltaic (PV) power station attached to our roof. I cannot imagine future owners going back to “old-fashioned” power generation. These panels should be good for 20 or 25 years. But they may not need to be around that long. I would be very surprised if after 6.3 years (yes, six and a quarter years), when it’s estimated we will have recouped our investment on this scheme, there won’t be far more efficient, and lighter and easier to fit, solar panels available. There’s been a surge in take-up, and it’s clear that the original budget will be exceeded (although the money comes from the utilities, paid for by a small surcharge on all bills, it is added to Treasury accounts, as if it’s public spending.) In effect too many people want to reduce their CO2 footprint. How can you have too many people wanting to be green, and after all, still spending a big chunk of their own money on it? I would recommend anybody who has the spare cash to fit panels before the government clamps down. It offers a very handsome return on investment, and it’s hard to see anything as good to put money on outside the perilous stock market. There are a few things that still trouble me. A disproportionately large number of the reasonably comfortable middle-class, well on in their property-owning life, are taking up the scheme. I don’t see many solar panels on the roofs of the less well-off homes (including housing association and former council houses) in the village where I live, where fuel poverty is likely to be experienced if there is any here. Then there are the dozens of new homes being built on the edge of my village with not a single solar panel on their very commodious roofs. Many of the big builders don’t seem to care, yet. Applying economies of scale, they could have been fitted with panels at a hefty discount to the price we paid while they were being built. Many of the owners, youngish couples with children going through local schools (just the sort of target market for the big eco-message), will still be here in 10 to 20 years or more from now, by which time they would have handsomely recouped the small extra sum on their original mortgage. And a conspicuous group of 40 or so houses , the roofs glinting with PV, would have sent a powerful message to passing traffic. But let’s see what extra inducements, if any, the government comes up with next April. Our home will not become zero carbon, because we run a gas-fired Rayburn, in itself an energy-efficient means of cooking, central heating and providing hot water. An ideal solution would be to replace it with an electrical Rayburn, but that would probably require more solar panels. Are we being subsidized? (We are estimated to save £236 a year on electricity, calculated at today’s prices. The Feed in Tariff, FIT, will pay us an estimated £1079 a year.) I suppose we are, by that small extra levied on energy bills that so enrages the Daily Mail. But then haven’t we, and you, subsidized fossil fuels for many years, particularly when the utilities were providing electricity to us (with government connivance) at artificially low rates, with no regard to the damage being done to the environment? We don’t feel smug, but we are happy to be making a small gesture (saving an estimated 1,004 kg of Co2 a year) to the health of the planet. It’s almost 20 years since the Radio Times put a photograph of a polar bear on its front cover, referencing a story inside on a phenomenon about we were just becoming aware: global warming. The progress to action, and even to a consensus of opinion, on this very real peril, has been agonizingly slow. Many governments and politicians still don’t “get it”, though the scientific consensus is now strong. In the past few years I’ve been heartened by signs of real progress, at least at the level of the small-scale initiative such as electric cars and this. I accept that solar power is still more expensive than energy from fossil fuels, although the prices are coming inexorably down. And the wonderful thing about solar power is that you don’t even have to believe in global warming to recognize its enormous benefits as a clean sopurce of energy. There is said to be more energy from the sun striking the Earth in an hour, than the world uses in a year. Since yesterday, with our 13 smart new all-black panels, we’ve been making a modest start to capture some of it. Previous PostRooftop power helps Red Dwarf star zero in on low driving bills	Next PostThere are two ways to go eyeball to eyeball with the Statue of Liberty.